As reported in the previous Invisible Bordeaux item, in the early years of the 20th century, the small community of Croix d’Hins became synonymous with its airfield. 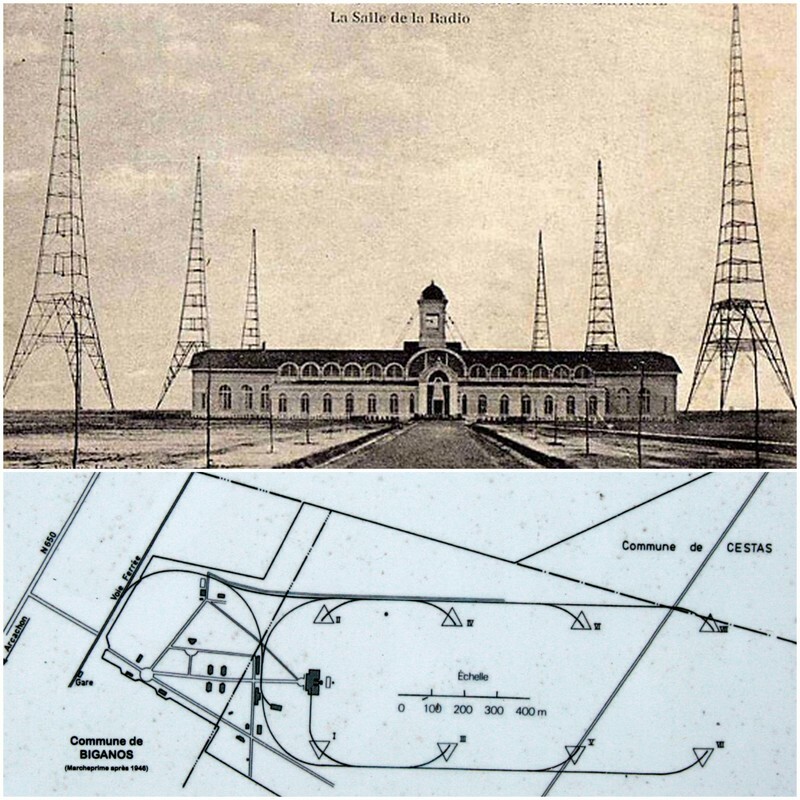 But as the airfield faded into obscurity, Croix d’Hins provided the setting for the construction of the world’s most powerful radio transmitter station. The eight-pylon station, which covered an area of 400 metres by 1,200 metres (the equivalent of 96 football pitches! 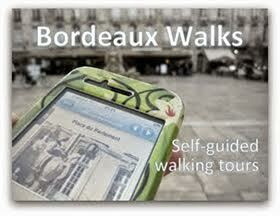 ), was a by-product of the First World War. During the conflict, ocean-bed telephone cables were severed and alternative means of long-range communication had to be explored. At the time, radiotelegraphy (or TSF in French, télégraphie sans fil) was developing rapidly and when the US joined Allied operations in 1917, they needed a reliable and permanent communications channel between Europe and the States. General Pershing, head of the American Expeditionary Forces, thus requested the construction of a radiotelegraphy station and Croix d’Hins emerged as the preferred site. 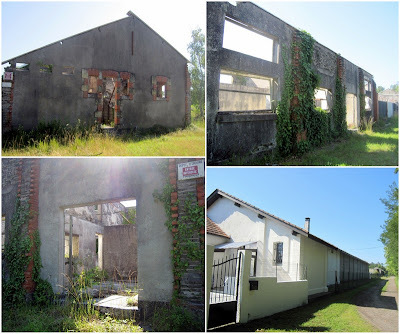 Assets included its location some distance from the frontlines, its proximity to the port of Bordeaux despite being outside urban areas, easy access to the railway network and, more generally, its optimal position near to the Atlantic coast, ideal for transatlantic messaging. Work began in March 1918 on building the transmitter and antennae, technical units, a water tower, a refectory, lodgings and even a school. To facilitate the task, a railway siding departed from the main line and led up to the main building. No less than 750 US Marines were drafted to the site to install equipment and erect the pylons, each of which was 250 metres high (making them the second-tallest self-supporting structures in France after the Eiffel Tower). They had been manufactured by the Pitt-Des Moines steel company in Pittsburgh, Pennsylvania. The main building flanked by six pylons, suggesting the photo was taken around 1918-1919. The map features on the information panel on site; the six smaller rectangular buildings to the bottom left can still be seen, as we shall find out further down the page. Top picture source: Wikipedia. When War ended in November 1918, only six of the eight pylons had been erected. Discussions took place between French and US representatives and it was agreed that the station should be completed. This was achieved in the following months and after some preliminary trials the first message was transmitted on August 21st 1920[*], with the official inauguration taking place on December 16th of that year. As a symbol of Franco-American friendship, the station was named Lafayette, in reference to the French general who had been instrumental in the American Revolutionary War. The grand opening in December 1920, an inside view of a transmitter, and the antennae linking up with the main building. Sources: Raconte-moi la radio and Wikipedia. Radio enthusiasts will find all the complex technical information they need about the station by skim-reading the articles which are available here and here. Suffice to say it was one powerful beast, generating magnetic fields that were so strong that visitors’ watches would rarely come out unscathed! 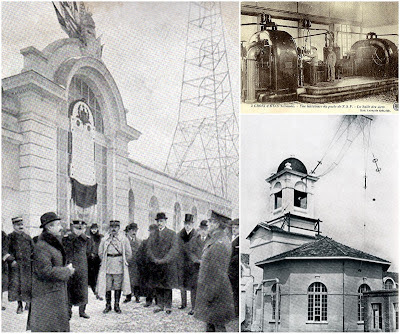 In the mid-1920s, the station, which now housed additional transmitters to ensure connections with Algeria, Morocco, Tunisia and Portugal, became known as Bordeaux-Lafayette-PTT (national postal, telegraphy and telephony service) and began to branch out into civilian operations. 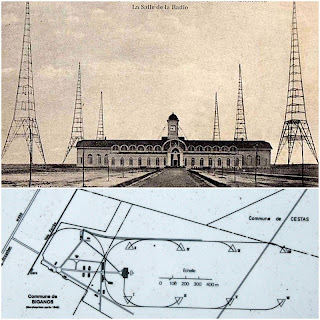 Around 1926, the station began broadcasting a daily digest of news and music, from studios in the Hôtel des Postes (a former Invisible Bordeaux subject) in central Bordeaux – which was linked up with Croix d’Hins as well as having its own transmitter. Listeners were now tuning into “Radio Bordeaux-Lafayette”, one of four such stations authorised to broadcast in the Aquitaine region (the others being Radio Agen, Radio Sud-Ouest and Radio Mont-de-Marsan). Of particular historical note is what happened on June 17th 1940: Radio Bordeaux-Lafayette broadcast a message delivered from its studio by Marshal Pétain, who had been appointed Premier of France in Bordeaux, as the Cabinet resolved to make peace with Germany. He called on his countrymen to surrender, telling them that “it is with a heavy heart that I tell you we must halt the combat” (“C'est le coeur serré que je vous dis qu'il faut cesser le combat”). The very next day, General Charles de Gaulle responded to his superior from London by giving a famous radio address, broadcast by the BBC, exhorting the French people to resist Nazi Germany. This has become widely known as “l’appel du 18 juin”. 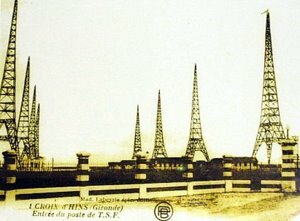 Meanwhile, the Croix d’Hins station was taken over by German forces, who regarded the facility and its long-wave transmission capabilities as an ideal means of communicating with its submarine crews. The station continued to operate until 1944, when it was largely destroyed by the Germans upon the arrival of the Allied forces in France. One final surviving pylon was demolished on November 21st 1953. Pylon-shaped information panel near the entrance to what is now a horse-riding club and stables. So what can be seen today? Very little! 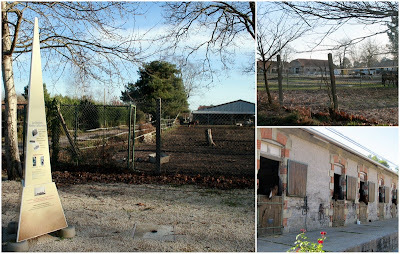 Part of the site is now a horse-riding club and stables, the Haras de Croix d'Hins. Some of the original buildings are therefore now occupied by… horses! Behind the riding club, what used to be the refectory and workshops can still be seen. The former now appears to be a private home while the latter lie in ruins. Down a lane, a concrete sentry box is a clear remnant of the station’s World War 2 legacy. Elsewhere in the area, two pylon bases (such as the one pictured below) can still be found, as tracked down by the authors of this radiofil.com article. Just like for the airfield, it is difficult to imagine this landscape forming the backdrop to such a grand structure, the story of which has been forgotten by most people who are not wartime or radio history enthusiasts. The municipality is catching up though: in February 2011 an antenna-shaped information panel and memorial to the radio station was installed outside the gates of the horse-riding club, serving as a permanent reminder of how much the view has changed! Find it: Rue de la Station, Croix d'Hins (Marcheprime). I desire that the first message sent after the official inauguration of the Lafayette Radio Station be a cordial greeting to the Republic of the United States of America. 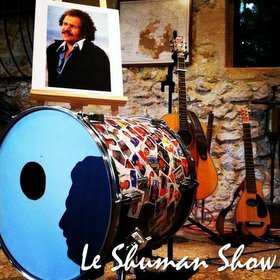 In the name of the French Government I send many thanks to the American Navy for the great part which it played in the construction of the most powerful radio station in the world. This collaboration maintained during the period of peace strengthens still further the unalterable friendship born of common struggles and victories. Asst. Secretary of Posts and Telegraphs. You too Diane, trust you're enjoying the sunshine. Yes, the Croix d'Hins skyline looks very different to how it did 90 years ago!